Islam unambiguously opposes terror tactics -- terrorism is not a religious ritual but a military strategy. Muslims condemn terrorism because it is as antithetical to their worldview. Almost all iterations of Islamic law explicitly classifies hirabah (terrorism and highway robbery) as a major sin. Indeed, the Qur'an proclaims: "If anyone kills a person without justification, it is as if they have killed the whole of humanity." Moreover, the Prophet Mohammed's strict rules of engagement even in times of hostility were blunt: "Do not kill women or children or non-combatants." Within minutes of the news, tweets and Facebook status updates queried why Muslims were not condemning the horrendous attacks in Paris. One Toronto couple even put up a lawn sign asking Muslims if they were sorry. Even a quick Google search reveals that Muslims came out strongly against the Paris attacks. Those who bothered to pay attention or suppressed their observer bias would have seen extensive coverage of this outpouring of condemnation. In fact, even major ultra-conservative groups around the world including the Saudi Council of Senior Scholars joined the chorus: "Terrorists are not sanctioned by Islam and these acts are contrary to values of mercy it brought to the world," said the statement. 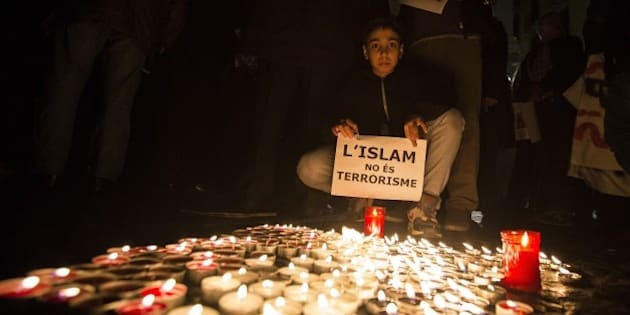 Muslim clerics representing the broad spectrum of sects and schools have not only condemned the attacks in Paris, but have been condemning terrorism itself for years. Here is a sampling compiled by Charles Kurzman, a professor and co-director of the Carolina Center for the Study of the Middle East and Muslim Civilizations. If this is not enough, virtually every prominent Islamic group and religious leader has condemned ISIS in one way or another. Even books have been written challenging ISIS's Islamic claims. Short of branding all newborn Muslims with an "I condemn all past, present and future violent acts committed by Muslims" tattoo at birth, there is not much else Muslims can offer. As Muslim basketball legend Kareem Abdul Jabbar brilliantly summed up, "When the Ku Klux Klan burns a cross in a black family's yard, Christians aren't required to explain how these aren't really Christian acts." Same can be asked about the Christian claims of Apartheid proponents and even the mass suicide of 900 people under Reverend Jim Jones. The double standard is not lost on many who ask why only Muslims should be held collectively responsible for the actions of a criminal fringe. Christians, Buddhists, Hindus, Jews, Sikhs and even animal rights and environmental activists are not expected to apologize for and distance themselves from terrorists among their ranks, and rightfully so. Before atheists get all smug, they should not forget their own fanatics and the fact that some from their ranks are responsible for far more death and destruction than religious people over the course of human history. Muslims condemn terrorism because it is as antithetical to their worldview. Almost all iterations of Islamic law explicitly classifies hirabah (terrorism and highway robbery) as a major sin. Indeed, the Qur'an proclaims: "If anyone kills a person without justification, it is as if they have killed the whole of humanity." Moreover, the Prophet Mohammed's strict rules of engagement even in times of hostility were blunt: "Do not kill women or children or non-combatants." Of course, critics have latched onto to the fact that these are subject to interpretation. They then uncritically accept the readings advanced by terrorists while dismissing outright more grounded interpretations with mainstream credibility. In doing so, these critics give credence to those who ignore centuries of jurisprudential methodology (and its inherent dynamism) and still claim to have on par status with those who stick to the established methodological tradition. This is intellectually akin to giving legitimacy to anarchists who claim to be upholding the Parliamentary common law system while ignoring constitutionalism, separation of powers and stare decisis (precedent), all of which are fundamental to the tradition. As Islamic scholar T.J. Winter of Cambridge University observed, "Terrorism is to jihad what adultery is to marriage." Indeed, this explains why polls have shown that Muslims are more likely than Christians or Jews to object to the targeting and killing of civilians. As CJ Werleman points out in a Salon piece, those who contend that terrorists are motivated by Islam while minimizing the economic, social, geo-political and military considerations are ignoring the facts. Interestingly, Marc Sageman, a psychiatrist who studies terrorism, says that most of us are guilty of "fundamental attribution error" (excessive emphasis on perceived internal motivation when it comes to judging the actions of others) whenever we look at what does or doesn't motivate terrorists. He says: "You attribute other people's behaviour to internal motivations but your own to circumstances. 'They're attacking us and therefore we have to attack them.'" The reality is that it is politics not religious ideas that lead to terrorism. Numerous research centres, including the University of Chicago's Project on Security and Terrorism (UCPST) which was partly funded by the Defense Department's Threat Reduction Agency have confirmed this. Robert A. Pape and James K. Feldman of UCPST have demonstrated that terrorism is overwhelmingly a strategic response to occupation, not an attempt to change our ways. Most people who join terror groups have excellent grasp of their grievances, but very poor understanding of Islam. Understandably, the nuances of Islamic jurisprudence is well beyond most recruits whose grievances are reinforced through propaganda. Indeed, a 2010 United States Institute for Peace study of more than 2,000 people who were attracted to terrorism found that they "have an inadequate understanding of their own religion, which makes them vulnerable to misinterpretations of the religious doctrine." ISIS, Boko Haram, Al Qaeda, Al Shabaab and Taliban all have different goals and targets, but they all have one thing in common: They have all killed more Muslims than non-Muslims. Though exact figures are hard to muster, based on available data from a number of sources including a 2011 report of the U.S. National Counterterrorism Center and the Global Terrorism Database (GTD) at the University of Maryland, we can safely conclude that the vast majority of victims are Muslims ("about half of all terrorist attacks, and 60 per cent of fatalities due to terrorist attacks, took place in Iraq, Afghanistan and Pakistan -- all of which have a mostly Muslim population"). In fact, Muslims are victimized twice -- by terrorists and those fighting them. A conservative estimate by Physicians for Social Responsibility, Physicians for Global Survival and the Nobel Prize-winning International Physicians for the Prevention of Nuclear War puts the civilian death toll at between 1.3 million and two million. All of this "collateral damage" and "bugsplat" translates to Muslim flesh and blood. Muslims clearly have more reason to hate terrorism in all its forms. Conventional wisdom will have you believe that Muslims commit most terrorist acts. In fact, according to Europol (the European Law Enforcement Agency), European figures suggest that only two per cent "of all terrorist attacks were committed by Islamic groups or individuals..."
Meanwhile in the United States, terrorism scholars Charles Kurzman and David Schanzer wrote in the New York Times that according to the FBI and other police agencies, "the main terrorist threat... is not from violent Muslim extremists, but from right­-wing extremists." They further point out that "...terrorism of all forms has accounted for a tiny proportion of violence in America. There have been more than 215,000 murders in the United States since 9/11. For every person killed by Muslim extremists, there have been 4,300 homicides from other threats." To provide some perspective without minimizing the threat, you are more likely to get hit by lightning than be killed by a terrorist, and chances are that the terrorist may not even be Muslim.